Yeah, but: "11 implements, 15 functions" - so why the "18" in the name? The Long Version: Wegner is the other maker of the Swiss Army Knife; this is one of the rare instances of two companies sharing a single brand. For what it's worth, Victorinox calls theirs 'Original' while Wegner brands theirs 'Genuine', and the logos on their knives are different. I'm not convinced that one is better than the other, but all of my other SAKs have been made by the higher-Google-ranked Victorinox. The EvoGrip18 is an interesting piece. Its novelty is that it has inset rubberized panels and a subtly contoured grip instead of simple smooth plastic scales. It is an improvement over the original, but had sharp edges around their perimeter until it had worn in a bit. Otherwise, this is a great little knife, and has almost exactly the tool mix that I've been looking for for years. The knife is tremendously sharp, the scissors are more robust than the little springy ones on the Victorinox knives I've owned, and the little saw is amazingly effective. For the screwdrivers, the Philips head is useful for most screws, and the slot-head is useful for most things that aren't screws. I wish that it had a red Robertson as well, but no matter how useful that might be to me, 85% of the world probably has no idea what that is. 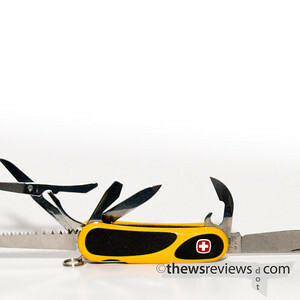 As a light multi-tool for minor tasks, just about any Swiss Army Knife is a good choice, and the mix of styles that are available means that there's bound to be the right one to have just-in-case. For any more serious jobs, they're not a replacement for a single-purpose tool. A real screwdriver, a locking knife, or an 18V reciprocating saw will always win the fight. A decent Swiss Army Knife is just the right tool to have when there aren't other tools handy, which makes them almost essential.